Molasses Creek Journal: News from Ocracoke Island and Beyond: Happy Spring! The signs are everywhere… trees are budding out, the azaleas are preparing to bloom, visitors are walking the streets, restaurants are opening… spring has sprung on Ocracoke! After a long winter of limited options, islanders and visitors now have a complete menu of dining opportunities. Howard’s Pub, Pony Island, Flying Melon, and the Café Atlantic are all back in business for the season. For dining al fresco on these beautiful spring days there’s Smacnally’s or the Creekside Café. Thai Moon carry-out is open, and so is Ocracoke Pizza Company. Jason’s, which served the island well in January and February, then closed for a month for some R and R, re-opened April 10th. The Back Porch will open as soon as they complete their recent renovations – the addition of a new façade and more indoor seating. Ocracoke Coffee Company is brewing up the caffeine each morning at 7am, and the new kid in town, Riley’s (in the former Mango Loco), is open seven days a week. Ocracoke’s wonderful and unique shops are stocking the shelves with new merchandise and opening their doors for another season. Everyone is excited about the newest shopping opportunity on the island – Village Thrift! 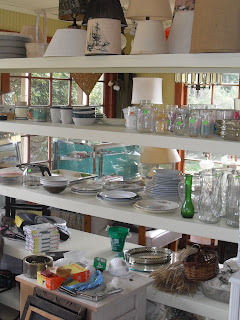 The thrift shop, which shares its space with Blue Door Antiques (an old favorite that is back and better than ever! ), will support the Ocracoke Youth Center by selling donated items, t-shirts and sweatshirts, and homemade bags. Village Thrift is the brainchild of Paula Schramel, owner of the Blue Door and a member of the OYC board. (She’s also the mastermind behind the Ocrafolk Festival Silent Auction!) Paula and the rest of the OYC board hope the thrift shop will provide an ongoing source of income for the Youth Center and bring in money for the non-profit organization from visitors as well as residents. The two shops occupy the retail space attached to Ocracoke Coffee Company that formerly housed Java Books. (Ocracoke still has a wonderful independent bookstore – Books to Be Red.) 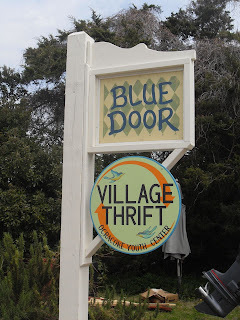 The Blue Door gets 2/3 of the space and Village Thrift takes 1/3; Paula manages both with no cost to OYC. The shops are open 8am to 4pm, seven days a week. Paula will work five days a week and volunteers will fill in on her days off. With low overhead costs, Village Thrift should bring in a steady income. Paula says that local response to the thrift store has been tremendous. She has already accepted many items, including some generous donations of furniture. The idea of creative reuse isn’t new on Ocracoke. Many residents fondly remember Cork’s Closet thrift store, which thrived for years. Most locals have a good story about finding just what they needed at the dump – affectionately known as Ocracoke’s Wal-mart, or “Jail-mart,” since it’s next door to the jail. And in the old days, islanders found uses for shipwrecked lumber and the flotsam and jetsam washed up on the beach. “Villagers’ use of salvaged materials goes back almost 300 years,” Paula said. She’s also happy to find a new home for The Blue Door. Originally opened in 2001 in an old house on Lighthouse Road, The Blue Door was a popular antique and gift shop for six years. Paula closed her shop so she and her husband Michael (co-owner of The Flying Melon restaurant) could start a complete historic renovation on the old house, where they now live. The new Blue Door will carry a selection of antique china, pottery, quilts, jewelry, paintings and more. There will also be some affordable used and antique furniture. Paula will consider taking big-ticket items on consignment if she has available space in the small shop. The Outer Banks Community Foundation (www.obcf.org) recently awarded a grant to OYC for start-up costs for the Village Thrift. The grant monies are paying for custom-built shelving and storage units, three exterior and one interior sign, a donation box for inside the store, advertising in local papers (which OYC is getting at a discount), and Village Thrift t-shirts and hooded sweatshirts to be sold in the shop. The OBCF grant also pays for bright green stickers for the Village Thrift items. Paula expects that traffic flow from the coffee shop, which has upwards of 500 customers a day in the summer, will be good, and that locals will stop in regularly to see what’s new. Ocracokers have been mightily busy preparing cottages and businesses for the new season. 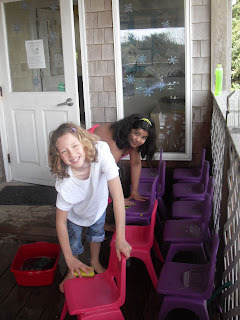 Ocracoke’s Junior Girl Scout trop decided to pitch in and do their share of spring cleaning. They recently completed their Community Clean-up badge with a service project at Ocracoke Child Care. 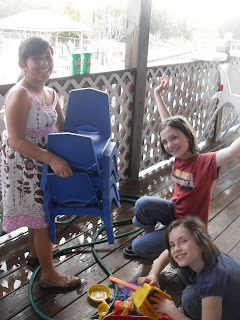 The Girl Scouts washed the center's windows and screens, and scrubbed all the classroom chairs. This was the fourth clean-up project for the Junior Girl Scout troop. They participated in the Big Sweep beach clean-up and the Beta Club village litter pick-up last fall, and spent a day in January cleaning all the toys and furniture in the Methodist Church nursery. Bricia Moreno, Caroline Temple, and Mattie Rose work on cleaning some outside toys. Ocracokers who didn’t get off the island this winter could at least live vicariously through some of our friends and neighbors who represented us in the big, wide world. To promote the library as a place to explore the unknown without leaving the comfort of your own home, Ocracoke Friends of the Library had a Travel theme for their March 31st annual membership meeting. Emma Lovejoy was one of three presenters who shared stories of their world travels. 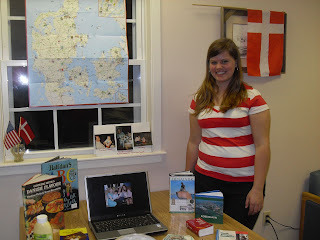 Emma spent 11 months over 2007-2008 in Denmark as an exchange student with the Youth for Understanding program. She's pictured here with maps, photos and souvenirs of her trip. Riggs Ellis gave a talk about her travels in Peru with her daughter Kate Plyer. Linda Austin came down from Hatteras (where she’s the secondary school’s librarian) to share stories about traveling to Europe and Guatemala, and biking the Allegheny trail from Pittsburgh to Washington, D.C.
Ocracoke Friends of the Library is a non-profit organization that supports and promotes literacy and the love of reading. Membership is $5 a year for individuals and $10 a year for families. Membership forms are available at the library. Island Kids Go to Washington! Not everyone was an armchair traveler this year. Ocracoke High School’s entire student body and most of the faculty took a fantastic weeklong trip to Washington, D.C. this spring. 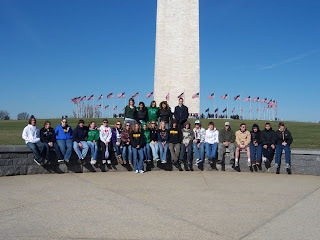 The kids toured the Presidential Monuments and the Capitol Building, and visited the Smithsonian Institution, Holocaust Memorial Museum, National Zoological Park, and Ford's Theater. They also attended an NBA game between the Washington Wizards and the Chicago Bulls. 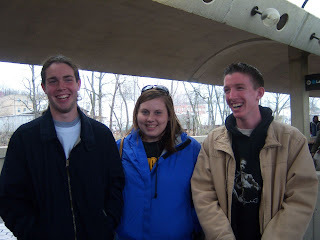 The big news of the week was when three students, Aaron Caswell, D.J. Lukefahr and Samantha Vander Myde, were accidentally left behind at a Metro stop when the rest of the group boarded the train. It wasn't long before they were all reunited, but it made for good adventure story. The OPS staff worked hard to get the museum ready to open this year. The building’s interior was painted over the winter, several maintenance projects were tackled, and some of favorite exhibits have been spruced up a bit. The OPS Gift Shop offers a nice selection of local books and, of course, music by Soundside Records musicians! 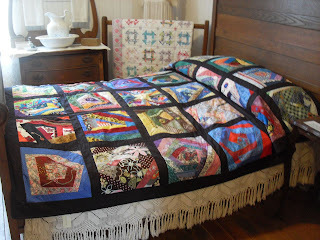 The beautiful new quilt, donated by the Ocracoke Needle and Thread Club is on the bed and raffle tickets are available! Admission to the Museum is free. It’s open Monday – Saturday, 10am- 4pm, and closed on Sundays. Quilt raffle tickets are $1 each or six for $5. The drawing will be held at the Fall Membership Meeting in November. In the meantime, enjoy the nice spring weather and don’t forget to plan ahead for the 2009 Ocrafolk Festival June 5-7.